Universities, in their capacity to draw a vibrant community of scholars, have attracted a diverse set of students from various ethnic, racial, religious, sexual, and class backgrounds. Yet, often, students from historically oppressed communities face covert and overt forms of discrimination throughout their experiences in the university system. This is particularly the case for those who harbor several identities that are subject to bigotry. While Princeton University celebrates its diversity, more could be done to address the barriers that students of color encounter on a daily basis within and outside of the classroom. It is foundational to the mission of PGSU to recognize the experiences of racialized students, work to fundamentally address institutional racism and structural inequality within the university and outside its walls, provide a space for all students to seek support and community, and act in our capacity as a collective body to address these concerns. 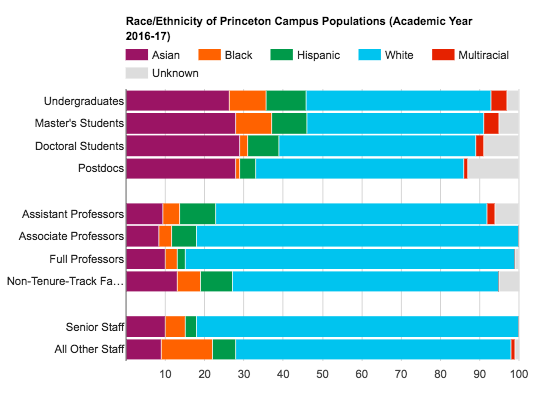 Source: Princeton University’s Office of Diversity and Inclusion, September 2017. Graduate union contracts at New York University [Article XIV], University of Michigan [Article IV], and Rutgers University [Article IV], to name a few, guarantee that violations of University non-discrimination policies can become grievances handled through the arbitration process. At New York University [Article XIV, §B] and University of Michigan [Article IV, §B], graduate workers invoking grievance procedures relating to a violation of the non-discrimination clause may bypass the usual initial steps (e.g., meeting with an immediate supervisor or departmental chairperson) and bring the grievance directly to the Provost, granting the worker valuable privacy on sensitive matters. The graduate union at University of Michigan have created fully-compensated and dedicated positions for graduate workers to address issues of diversity. Unionization is one mechanism by which racialized students can exercise their collective power to challenge institutional racism. It is in the context of having union representation that workers are able to gain the confidence and representation to advocate for better treatment. PGSU recognizes the work done by dedicated students, faculty, and administrators in department and university-wide settings, especially through the Office of Diversity and Inclusion. We are committed to working alongside existing student organizations to build solidarity and move together towards a Princeton in which all students feel welcome, represented, supported, and heard. The precarity of higher education and academic employment disproportionately affects racialized people, and therefore it is crucial that graduate students’ status as workers be considered in tandem with the work of diversity and inclusion within the University, and this can be done only through collective action. Attentiveness to racism and other forms of discrimination does not simply mean addressing individual acts or grievances, though that is crucial; it involves taking seriously the concerns and experiences of racialized individuals and groups on a systemic level, and working in the short-, medium-, and long-term to ensure that students, staff, and faculty of color can work and live in the Princeton community safely and fully. Collective bargaining is a way for graduate students as a whole to advocate for those among us who are vulnerable in particular ways to the institutional racism, structural inequality, and neoliberalization of the American higher education system. Anecdotal evidence of racial discrimination, racialized treatment, and barriers to access and support show that more can be done not only to support students of color, including but not limited to Black and African American students, Latinx students, undocumented students, and Indigenous students. Legal support and direct and accountable advocacy are two concrete ways that students in positions of vulnerability can seek support through the collective power of a graduate union. Currently, if a student faces harassment, biased treatment, or discrimination, they are asked to fill out a complaint form and a grievance process begins through the Office of the Vice Provost for Institutional Equity and Diversity, which “invokes the University’s internal investigative process.” While this procedure is necessary and helpful in some cases, PGSU is skeptical of the University’s imperative to adequately address these concerns when the individual(s) under investigation are themselves representatives of the University, which is likely in our tight-knit community. A union is a body institutionally and financially independent from the university, led by and composed of graduate students, which means that it can put pressure on the University to act when it is not acting, collaborate with the University to create policy and structural supports for racialized students, and provide an avenue for advocacy and representation in grievance procedures.